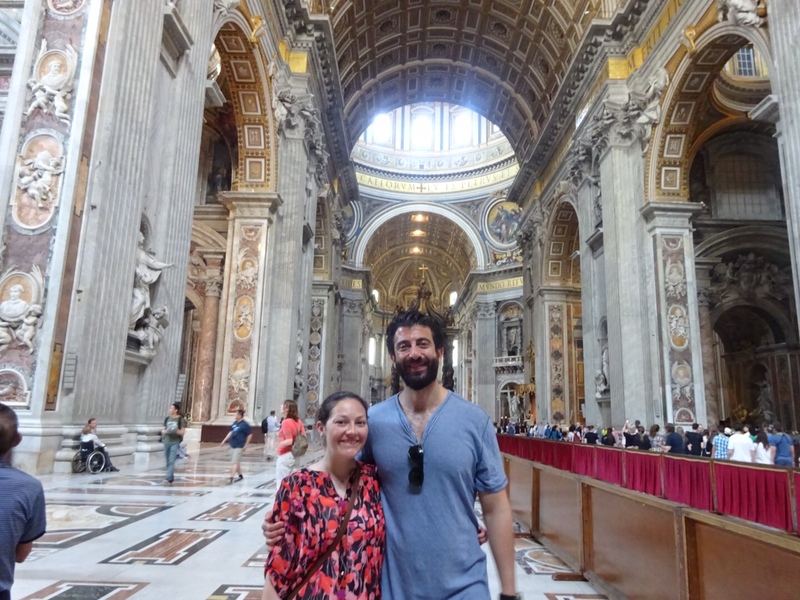 Jack and I spent five nights in Rome last June and we absolutely fell in love with the Eternal City. We enjoyed walking along the cobblestone streets, taking in the history and architecture, feeling the energy of the city, and eating the amazing food. However, we had heard mixed reviews before our trip; most of our friends are fans, but others complained that Rome was too crowded and touristy. After experiencing the city first hand at the peak of travel season, I can see where one could come to either conclusion. My theory about the tourists in Rome is as follows: every major city is going to have sites that are crowded with tourists (think Times Square in NYC), but in Rome, these sites are spread throughout the city because they are ancient sites, rather than built around a city center. 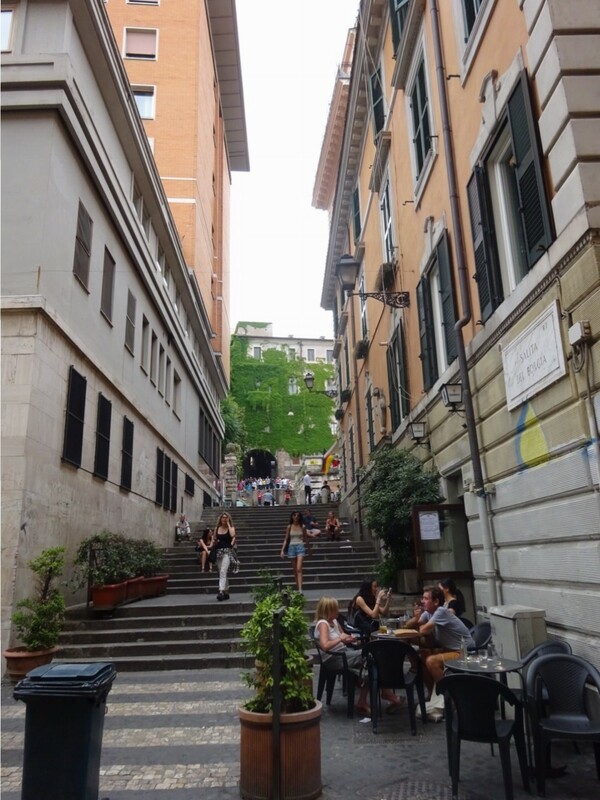 So, you’ll find yourself having a romantic stroll in a quaint Roman neighborhood such as Monti, with great restaurants, cafés, and shops, then – wham! – you turn a corner and you’re staring at the Colosseum, and there are tourists everywhere, locals selling cheap souvenirs, and restaurants that post pictures of their food on the menu. Once Jack and I figured this out, we were much less overwhelmed by the city, and we learned to just duck back down a quiet street when we didn’t feel like battling the tourists at the popular sites. We stayed at the Westin Excelcior primarily because we had Starwood points. We were happy with this hotel; it is large and grand, and the concierge was very helpful in making restaurant reservations and coordinating our transportation. The hotel is located along Via Veneto, where there are many high end hotels. 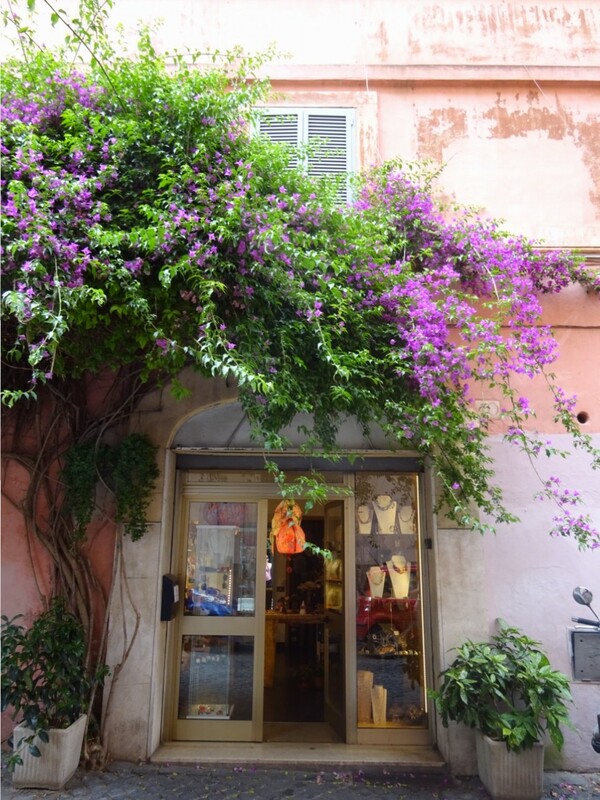 It is within walking distance of the Spanish Steps and the Borghese Gardens and Gallery, as well as the underground Metro. It was a nice hotel and I would definitely stay there again. 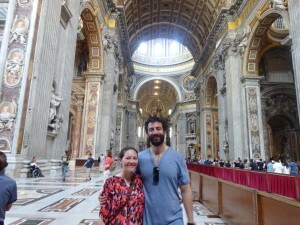 Several friends advised us to do a guided tour of the Vatican, and we were happy we listened to this advice. We booked with LivItaly Tours and enjoyed our small group guided tours. 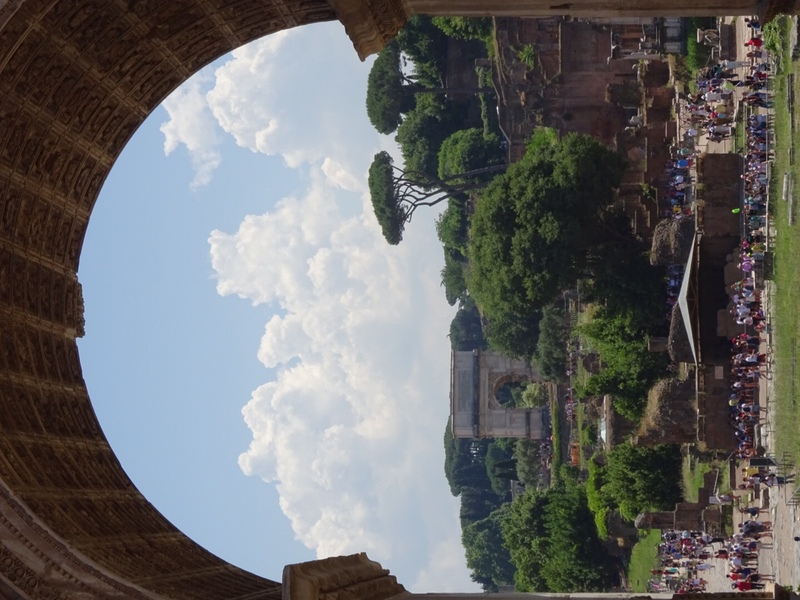 The first day we did a tour of the Colosseum and Ancient Rome (we were in a group with two other people), which included a lot of walking outside, so be sure to bring water, sunscreen, a hat, and comfortable shoes. We learned a lot about the history of Ancient Rome, and our guide was very knowledgeable (we also really enjoyed hearing her say “MAH-BLE” over and over again). The next day we did the Vatican Tour with Early Entry (group of six, with the same guide from the day before), and we were grateful that we were able to see the Sistine Chapel before it got really crowded later in the day. St Peter’s Basilica was incredible and massive, though a bit over the top with its marble decorations (I did really enjoy seeing Michelangelo’s Pietà). Jack and I both agreed that we found Gaudí’s Sagrada Familia in Barcelona to be a bit more moving in its beauty (don’t tell the pope!). Rome is a very walkable city. Wear comfortable shoes (I lived in my Keens) and explore all the different neighborhoods. The Metro is helpful for getting to certain parts of the city, but we were disappointed that it didn’t go to more places (my theory is that the Metro had to be built around the ancient sites that couldn’t be dug up, so it is very limited in its number of routes). We walked all over the city, stopping to see the Spanish Steps (under construction and very crowded), the Trevi Fountain (also under construction, so was drained and not lit up), and the Pantheon (perhaps my favorite ancient site that we visited). 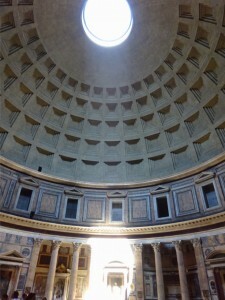 I found it interesting that the Pantheon was built at roughly the same time as the Colosseum, but because it was always used as a church, it was well maintained and never allowed to become a “ruin.” Entrance to the Pantheon is free, so you can stop in as many times as you want during your stay. One of my best friends visited Rome a couple years ago and tells the story that every morning she would drink her coffee inside the Pantheon and write in her journal as rain fell through the center of the dome. Can you think of a more peaceful image? 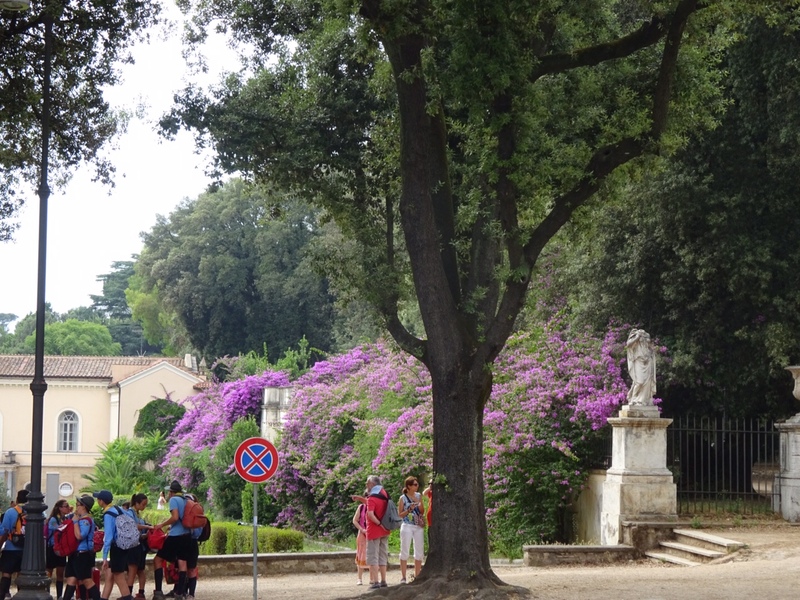 We didn’t get a chance to visit the Borghese Gallery (you must reserve tickets several weeks in advance), but we did have a lovely walk through the gardens at the Villa Borghese, which was very close to our hotel. It was a lovely way to walk off our gelato! We also visited the Capuchin Crypt near our hotel, which was fascinating. The crypt is located beneath the Capuchin Monk Museum, and contains the skeletal remains of 3,700 bodies believed to be Capuchin friars. It was super eery, but worth seeing if you’re up for a quick, creepy tour. As a side note, the “cappuccino” coffee drink gets its name from the the brown habits worn by the Capuchin monks, as it is a similar color to the beverage, which is made of espresso and milk. 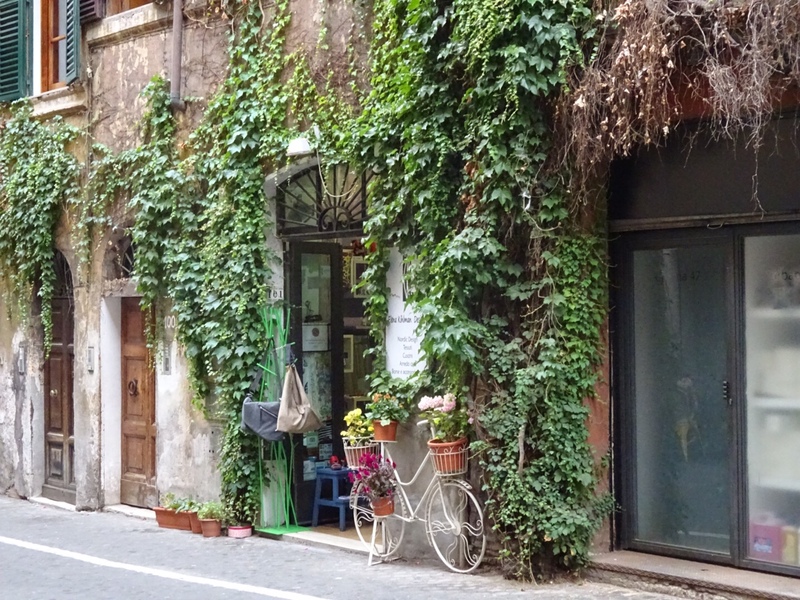 As I mentioned earlier, it is so lovely to just walk the streets of Rome. You could be right next to a large tourist attraction, then you will turn onto a cute, narrow, cobble-stone street that feels like your own secret spot. The neighborhood Monti felt like this to us. 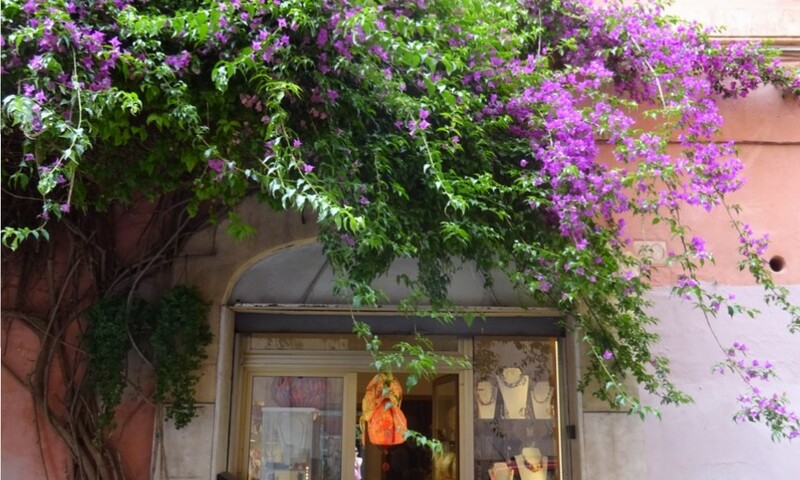 It was recommended to us by a young woman who helped us in a clothing shop near the Pantheon. Monti is right by the Colosseum, but it is so quaint and special. We were there in early June, so the flowers were in full bloom. We also stumbled upon Broccoletti, a fabulous restaurant where we had one of our most memorable meals in Rome. Here’s a great New York Times article about Monti from 2011. 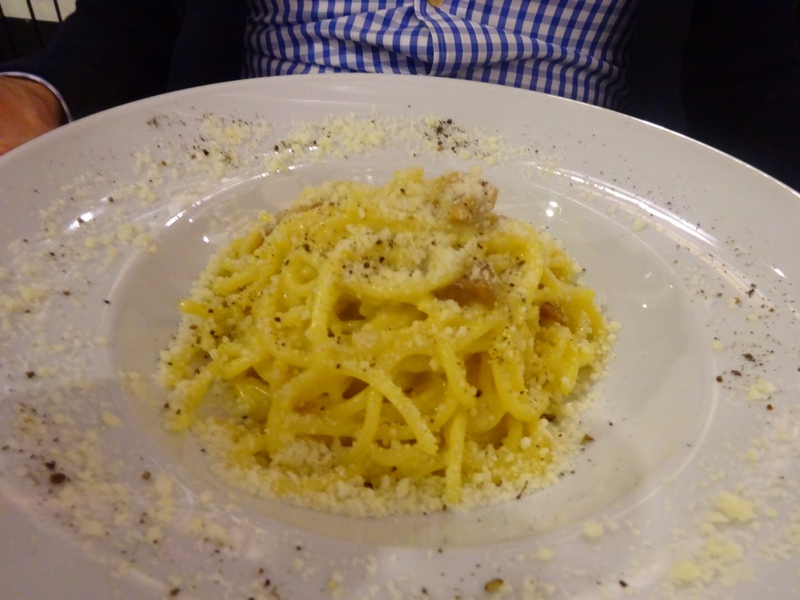 We ate incredibly well in Rome. I don’t think we had a bad meal the whole time we were there. Four restaurants really stand out in my memory of the trip and I highly recommend visiting all of them if you have a chance to spend several days in this ancient city. Glass Hostaria: We learned about this restaurant from our Lonely Planet guidebook. 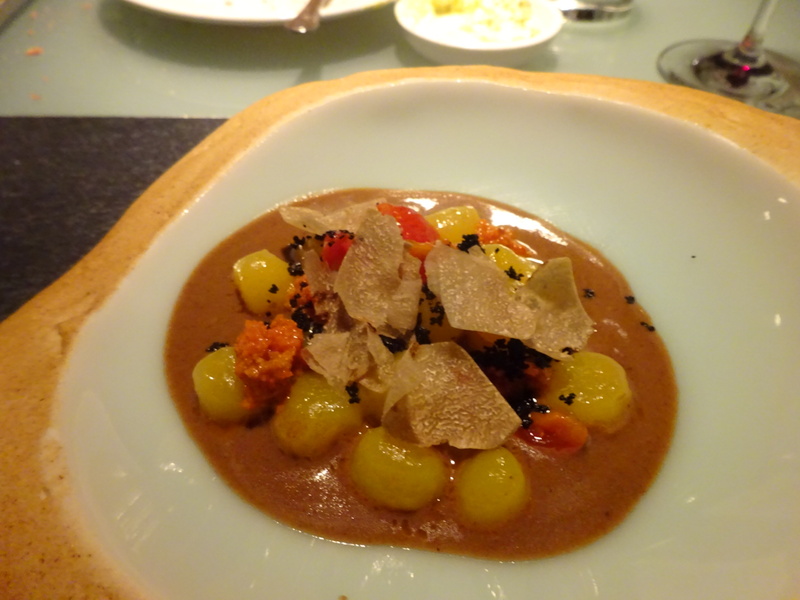 It was quite a bit pricier than our other meals in Rome, but it was delicious (the restaurant has one Michelin star). Glass Hostaria is located in Trastevere, a bustling neighborhood that has plenty of good restaurants. We enjoyed walking around the neighborhood at night (though getting a cab back to the hotel was a nightmare, as the taxi stand had a line of 20+ people in it!) I enjoyed everything I ate at Glass Hosteria, but I remember the gnocchi being one of my favorite dishes from the entire trip. I also remember that the lights of the entire restaurant went out for a good ten minutes, which was a first for me. But once power was restored, everything went back to normal and it was as if nothing happened. 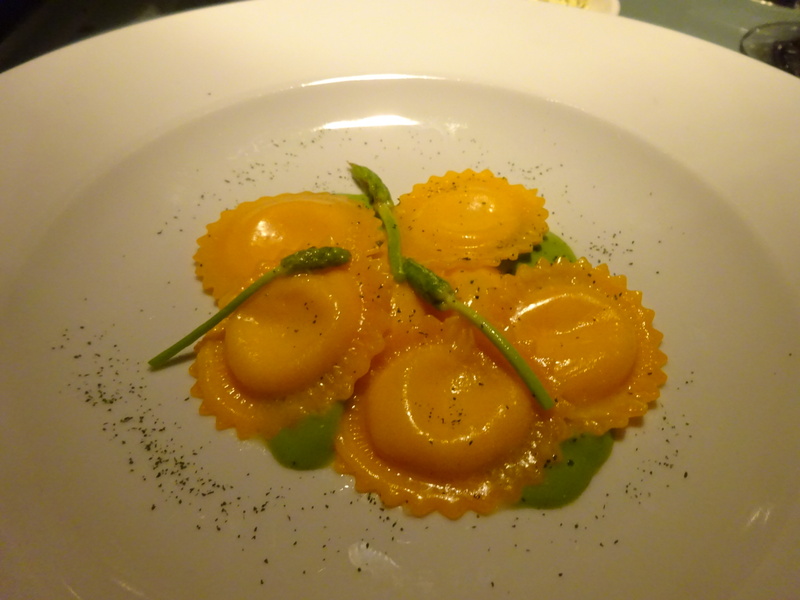 Broccoletti: We stumbled upon this restaurant while we were exploring the neighborhood of Monti. It looked like a good spot, so we went back for dinner that night. The restaurant was very cute and cozy, with a creative, seasonal menu. We really enjoyed the pasta with cherry tomatoes and bacon; it sounded so simple, but the tomato sauce had a nice depth of sweet/umami flavor, like it had simmered all day. The bacon was thick and chewy-crispy and delicious. 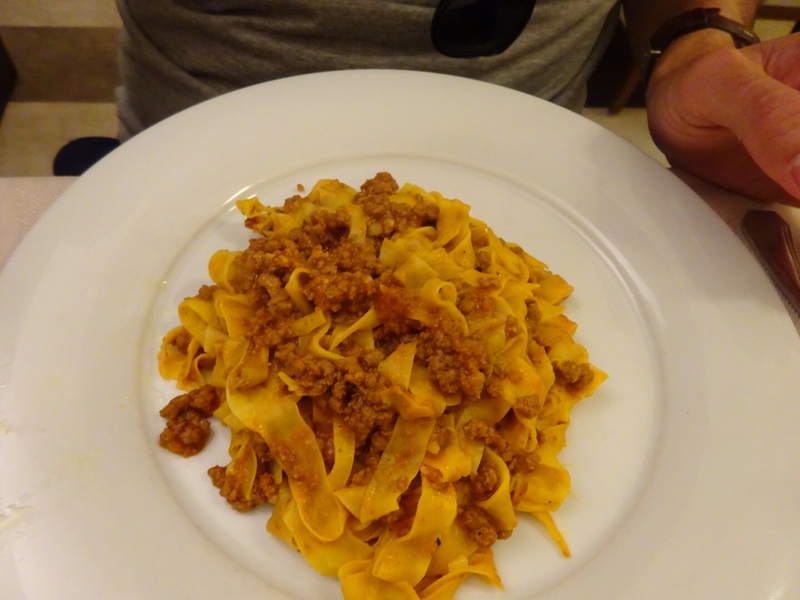 Colline Emiliane: We had spent two nights in Bologna before we arrived in Rome, and we developed a serious taste for Bolognese cuisine. 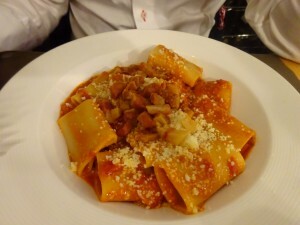 Thus, we were pleased to learn that there was an authentic Bolognese restaurant very close to our hotel. The pasta was just what we were craving and it was a solid spot for lunch or dinner. Roscioli: Check out my blog post on Roscioli here. This was our final and favorite meal in Rome. 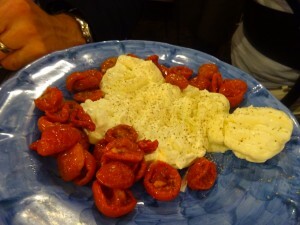 The standout dishes were the roasted tomatoes with burrata and the classic Roman dish of pasta alla carbonara. 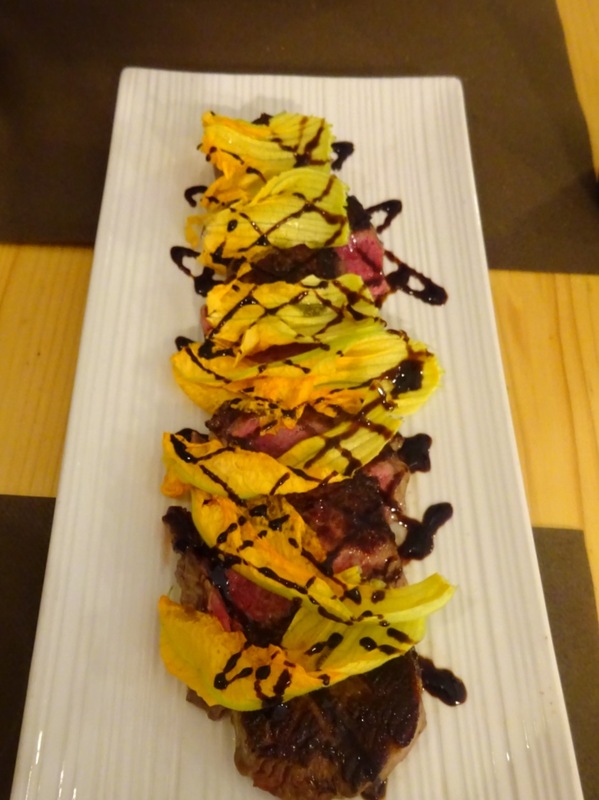 They also do a food and wine pairing on certain nights of the week in their private tasting room Rimessa Roscioli, which I’ve heard is fabulous. This spot is not to be missed. Spaghettone pasta tossed with crispy pork cheek, Masaisian black pepper, Paolo parisi eggs, and Romanian Pecorino cheese D.O.P. 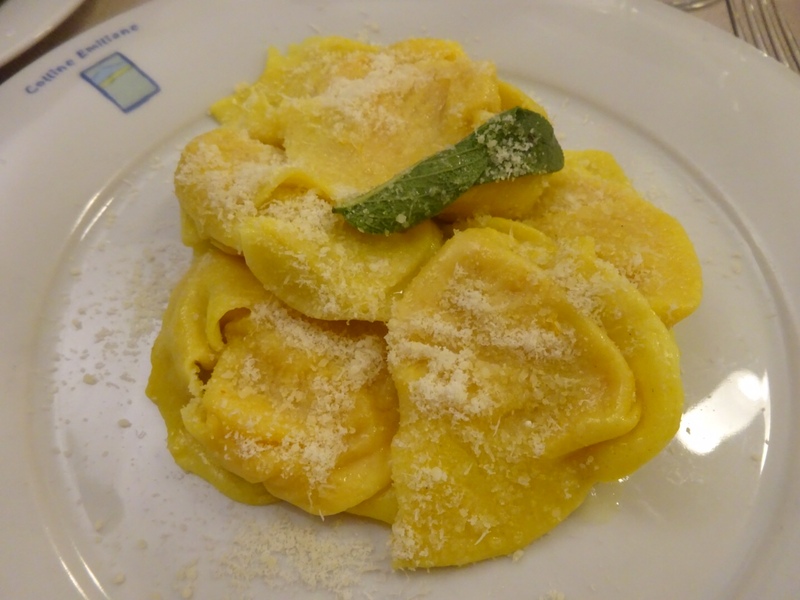 Question: What other can’t-miss restaurants, hotels, and activities do you recommend seeing when in Rome? This is wonderful. I love reading your blog. We are staying in a lovely hotel in Trastevere. I particularly like that area because of the absence of cars. 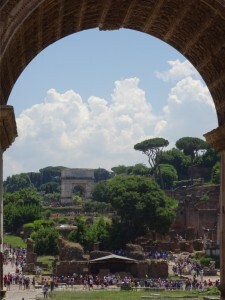 The last time we were in Rome, we have been there 4 times, we decided that we weren’t going back again. It was during the Berlesconi area and the city was a mess: there was garbage everywhere, the grafitti was not like Banksy but just kind of dirty, construction seemed lacadaisical, nothing seemed to be working. Your last trip is what convinced us to start our tour of Southern Italy with Rome. We have never been south of Rome. 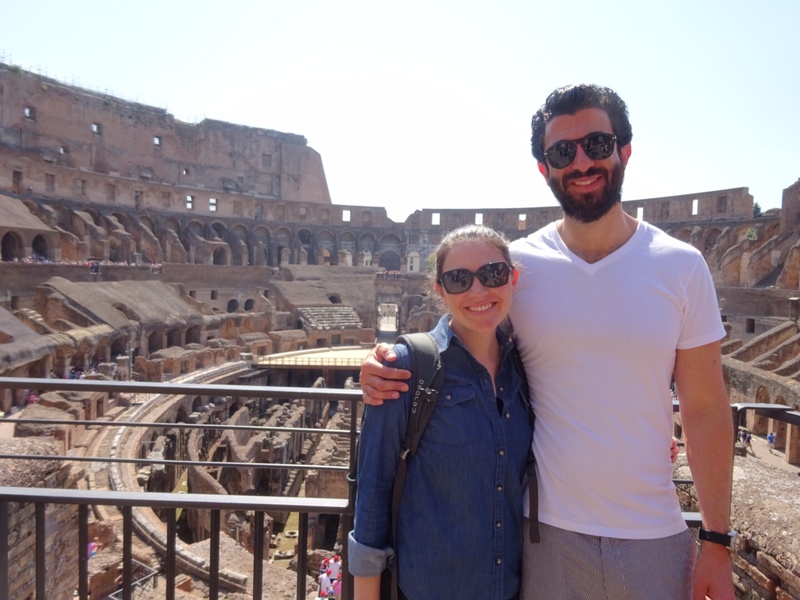 This trip we will be in Rome, Sicily – for 2 weeks – Sorrento, Puglia, Umbria, and Florence. We will use and trust your dining guide. We have also never found a good walking guide in Italy so we will look into LiveItaly tours. You have to go back because the Borghese Gallery is amazing. I just watched To Rome With Love again. 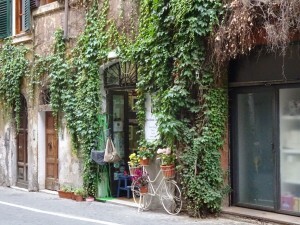 Almost all of it is in Trastevere. Can you tell I am getting excited? We leave April 27.